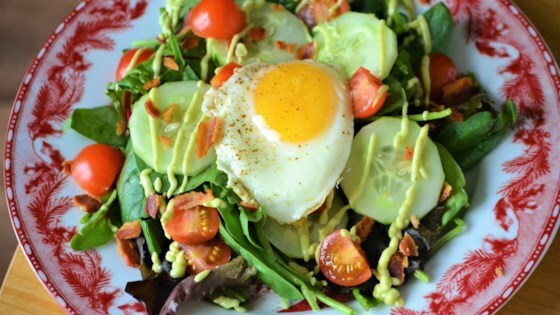 "Add a little green to your morning bacon and eggs by turning them into a salad! Refrigerate any unused dressing and use within a few days." Combine avocado, lemon juice, Greek yogurt, olive oil, garlic powder, onion powder, cumin, salt, and black pepper in a small food processor. Pulse until mixture is smooth. Add water or milk to thin out dressing to desired consistency. Set aside. Cook bacon in a medium nonstick skillet over medium heat until crispy, about 5 minutes. Drain on a paper towel-lined plate. Allow to cool; crumble into small pieces. Remove all but 1 tablespoon of bacon grease from the skillet. Add eggs; cover and cook until whites are set and yolks are barely set, 3 to 5 minutes. Season with salt and pepper. Divide mixed greens, tomatoes, cucumber slices, and bacon crumbles between 2 plates. Drizzle in desired amount of avocado dressing. Top each salad with an egg. Serve immediately. Substitute milk for the water if desired.